Excavation: March 14-25, 1952. Final excavation report: de Vaux, DJD III. “19/3/1952. The cave in its original shape was very large, about 10 m. wide, but the ceiling had completely collapsed except in the rear part where one chamber, about 3 x 2 m in size, remained. In front of this chamber was a large quantity of broken jars and lids mixed with debris from the ceiling without any earthen fill. This layer was 30-40 cm. thick. In the rear chamber of the cave were stratified layers of pebbles with some fragments of fabric and darkened leather, along with some inscribed fragments. Very few potsherds in this area. This chamber is extended by a narrow passage and rises toward a cavity nearly completely filled by rats’ nests containing pieces of cloth, bits of leather and one inscribed fragment. Just in the north corner of the chamber, two inscribed copper scrolls had been placed one on top of the other against the rock wall (DJD III, pl. III, 2). In front of the heap of pottery, about 10 meters from west to east extends a fine argilacious deposit containing some potsherds, which is covered by the debris from the ceiling. We can’t say what the early entrance was like, but the cave (its ceiling) was very low and, while the jars were still intact, they must have nearly touched the ceiling. R. DE VAUX, “Exploration of the Region of Qumran”, RB 60 (1953) p. 555. GQ 8-1 through 3: lids. GQ 8-4: upper part of jug. GQ 8-5: upper part of jug. GQ 8-6: lid. GQ 8-7: jar. GQ 8-8 through 9: jars. GQ 8-10: inscribed jar. GQ 8-11: jar. GQ 8-12: Herodian lamp. GQ 8-13 through 29: lids. Textiles: Many; akin to textiles from 11Q. Dissimilar to those of Cave 1Q. KQAF II pp. 265f. 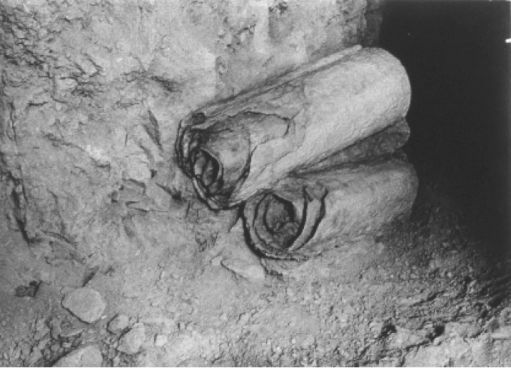 This is the only “scroll cave” discovered during the cave survey of March 1952 (PAM 41.960). Excavations uncovered 29 registered pottery items, textiles and at least 9 manuscripts (PAM 40.406-406A; 41.563-566; 42.554, 576-577, 593, 955-956) as well as the “Copper Scroll” (3Q15; PAM 40.092-111; 41.958, 42.112-117, 42.977-43.000). See chap. II. Also from excavation: objects (PAM 42.654). If we would allow Cave 3 to speak for itself . . .